Labeo rohita: Day, 1878; Bhuiyan, 1964; Shaw and Shebbeare, 1937. 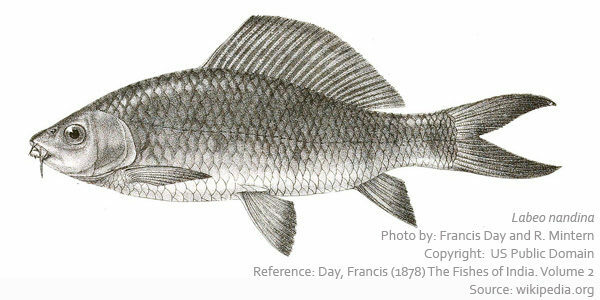 Labeo rohita (Hamilton) or Rohu or Rui is the natural inhabitant of river, streams, canals, beels of Bangladesh, India, Pakistan, Nepal and Myanmar. 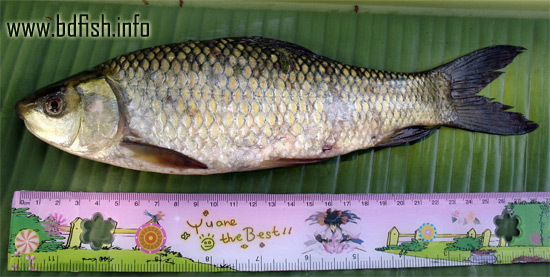 But it is also found in lakes, ox-bow lakes, ponds, ditch and similar water bodies. Local names: Bangladesh: Nandil (নান্দিনা), Nandina (নান্দিল), Nandani (নান্দানি) and Nayanda (নৌন্দা). India: Nandi and Nandan (Tawlar and Jhingran, 1991). A Least Concern (LC) species is one which has been categorized by the International Union for Conservation of Nature (IUCN) as likely lowest risk, widespread, abundant taxon and does not qualify for a more at-risk category.